About the article - How to print or view the BSNL Landline duplicate bill online and how to get the BSNL duplicate bill through customer care. This article will help you to know how to view the BSNL duplicate bill online easily. It also explains how to get the BSNL duplicate bill by calling the customer care. If you have internet connection, it is better to view the BSNL copy bill online itself instead of making calls to customer care and waiting for the representative to take your call. Why do you need BSNL duplicate bill? Due to some difficulties it may take time for the bill to get delivered, sometimes we may not receive the bill. In that case we can download the duplicate BSNL bill print through online BSNL website. The delivery of the bill might get delayed. You might not have been present at home when the person tried to deliver at your home. There might be some unforeseen circumstances like flood, rain and so on. Whatever might be the reason, you have to pay your BSNL Landline bill to avoid hassles. To get the landline service continued, you should pay your bill without fail. Delay in paying the bill will also put you in the burden of paying the fine amount in excess unnecessarily. Not only the delay of receiving the BSNL bill to your home, there might be few other circumstances too. Many of us might have misplaced the BSNL bill after checking out. Very few of us remember the bill amount. We forget the bill amount most of the time. The original bsnl might have been damaged. The kids might have played with your bsnl bill and it might get damaged to the level where you cannot see the bill amount properly. While few people do not have worries about the bill amount and ready to pay how huge the amount it is, there are some people who have to plan for the bill amount. You can follow the below given procedure to print or view the bsnl duplicate bill online. 2. You will find View bills tab on the top of the page. Sign into the website. 3. Now enter the landline number with the STD code,for example if you are from Chennai enter the STD code 044 and then the phone number i.e 044-123456. 4. Enter your account number (In case if you are not aware of the account number refer your old bills or call the customer care) and click Submit. 5. Your bill will be displayed. You can click on the download button in order to download the Bsnl duplicate bill. You can call the customer care to get the duplicate bill. They will take a request for duplicate bill and send it again to your residential address. The customer care number to get the BSNL duplicate bill is 198/1500/1800-345-1500. 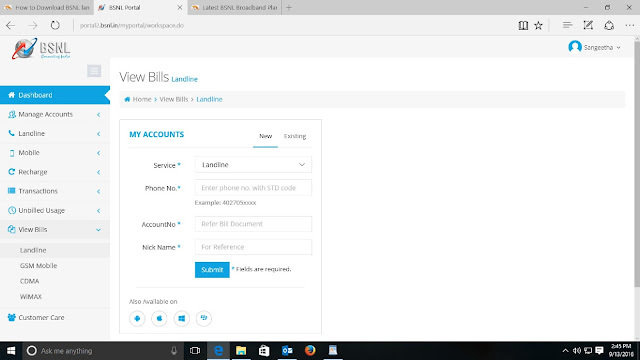 If you are not getting the bsnl bills to your residential address properly, you can call the BSNL customer service to know what the problem is. They will tell you why you are not receiving and help you to rectify it. Landline not working Dial 198/1500/1800-345-1500 (Other Operator). It gives you information about the toll free number to contact incase of any enquiry fora particular service and the online forms that are available. Bharath Sanchar Nigam limited (BSNL) is a state owned telephone service provider having his head quarters in delhi. Despite of so many so many service providers arising every nook and corner these days, BSNL has proved itself to be a Giant of service provider. Bharat Sanchar Nigam Limited is a telephone service provider company run by the governmant of India. It standly promimently for the broad range of service they provide in India. Inspite of so much competition all around BSNL has strived to take their stand in providing widest communication network services. The services provided by BSNL are , Cellone - GSM cellular mobile services, Telecome services such as MPLS, P2P and internet leased lines. Fixed line and landline services using CDMA technology. Interenet services as dial connection for prepaid, Netone connection for postpaid and DataOne for BSNL Broadband. BSNL offers value-added services, such as Free Phone Service (FPH), India Telephone Card (Prepaid card), Account Card Calling (ACC), Virtual Private Network (VPN), Tele-voting, Premium Rate Service (PRM), Universal Access Number (UAN). BSNL has its network spread across 800 cities in India. We can get started with a BSNL service easily by requesting for a service in the nearby BSNL office or Online. Once you request for a Landline phone service by providing necessary documents, the service personnel review your request and install the phone service in the residence you have given. This process may take maximum of a week's time. There after you can receive and make calls. The bill will be sent to the residential address that is registered with BSNL , through post. Hope this article gives you detailed explanation about starting up with BSNL , getting duplicate bill and handling customer support. With the facility of downloading the bsnl duplicate bill online, you can avoid the visit to the BSNL branch directly. You can also avoid making calls to customer support.